Carlos García is a Colombian filmmaker and sound artist specializing in sound design, mixing and post-production for film. After 15 years in the audiovisual field he created Blond Indian Films to promote projects at the international level. As a producer at the company he has worked on Birds of Passage (Pájaros de Verano, 2018), together with Ciudad Lunar; Atlantic Produce Togo S.A. (2012); Violence (Violencia, 2015), together with Burning Blue; and the short film Damiana (2015). Carlos Esteban García Flórez was born in Cartagena on November 4th, 1979. His professional training includes sound design studies for television and film at the Academy of Media Arts Cologne in Germany, a specialization in sound for film from the International School of Film and Television of San Antonio de los Baños, Cuba, studies in directing and producing for film and television, music studies at the Superior Academy of Arts of Bogotá and directing and casting at EICTV. García was also part of the Berlinale Talent Campus in 2006. His work has earned him nominations and awards at several international competitions including the Goya Awards, the Oscars, the Berlinale, the Cannes Film Festival and the San Sebastián Film Festival, to name a few. 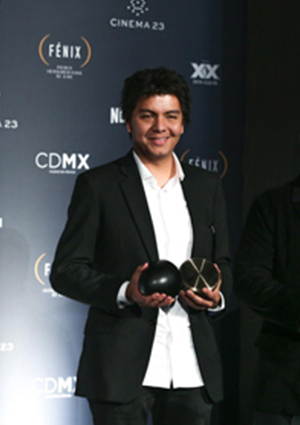 He won the Platino Award for Best Sound, the Fenix Award and the Macondo for Best Sound Design for Embrace of the Serpent and another Macondo for Immortal (Siempreviva). He received a Film Development Fund of Colombia (FDC) scriptwriting grant and participated in EAVE Puentes 2012 (Montevideo) and Australab 2012 (Chile) with La Resistencia. He was awarded the Mestre Mateo Award for Best Sound in 2013 for The Apostle (O Apóstolo) and in 2011 for Wrinkles (Arrugas). With El Espino he participated in the 2013 project development forum at the Cartagena Film Festival, won second prize for Best Score at the 2006 Berlin Film Festival Talent Campus, was included in the Official Selection at Cinefoundation and received the award for Best Soundtrack at the New Filmmakers Festival. He received the Colmenar Award for Sound Design for En el insomnio, the Goya award for Best Sound for Cell 211 (Celda 211) and won Best Documentary at the Las Palmas Festival for La vida según era. With Blond Indian Films he received a comprehensive grant from the FDC for producing Birds of Passage (2018), and he was also the recipient of an award for technical skills for Episodios sinfónicos Carlos García from Columbia College in the United States. He has worked on 87 feature films to date in a variety of areas related to sound. 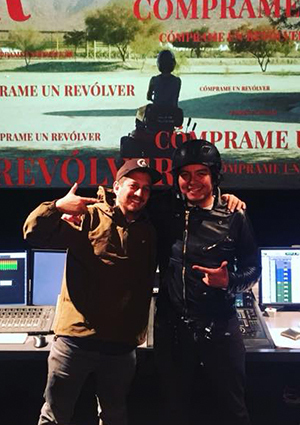 His most recent projects as sound designer and mixer include the following films premiered at the 50th Directors’ Fortnight at the Cannes Film Festival: Birds of Passage by Ciro Guerra and Cristina Gallego, Buy Me a Gun (Cómprame un revólver) by Julio Hernández Cordón and the Spanish feature film Petra by Jaime Rosales. García’s filmography also includes sound design for Embrace of the Serpent by Ciro Guerra; sound and Foley editing for Nymphomaniac by Lars Von Trier; sound design, Foley editing and mixing for Violence by Jorge Forero; sound design and mixing for Disportrait; sound design for Immortal; direct sound, sound design and mixing for film for Paisaje indeleble; sound design and mixing for film for Hotel Nueva Isla; mixing for film for Azeu (Spain, Morocco) and Tacacho (Switzerland); post-production directing and mixing for film for Sonido Bestial; sound design, mixing for film and musical concept for Edificio royal; mixing for film for Amores peligrosos and Atlantic Produce Togo S.A. and direct sound for filming in San Sebastián for Teddy Bear. García also worked on La Playa D.C. doing the mixing for the trailer, on Heridas doing filming and Foley effects, on Cold Water of the Sea (Agua fría de mar) doing filming and in the FX room, on Piratas in direct sound and post-production for eight episodes of the high-definition series and the version for film, on Un día en el paraíso in sound design and mixing for film, on the animated films En el insomnio and Mi vida en tus manos in sound design and mixing and on The Swimming Pool (La piscina) as mixer for the film version. His other contributions as a sound designer include Paisaje indeleble (2015), Saudo, Labyrinth of Souls (Saudó laberinto de almas, 2016), The Sacrifice (Siete cabezas, 2017) and Amazona (2017). Finally, García’s experience in the world of film includes teaching at the International School of Film and Television of San Antonio de los Baños, Cuba, and giving courses in direct sound and sound post-production open to students from other universities at the Center of Audiovisual Studies in the Canary Islands. He was the coordinator of Extramuros Colombia and served as one of its directors. He taught a Master Class in sound for film in 2010 at the School of Image and Sound of A Coruña, Spain, and held forums on sound for film in 2007 at the Museum of Modern Art of Bogotá. He gave talks on sound and sound theory at the National University of Colombia also in 2007, and taught a module on sound for students in their final year of audiovisual studies at the Black María Film School in 2005.